Enhancing food security through improved seed systems of appropriate varieties of cassava, potato and sweet potatoes. BioInnovate Africa/Projects/Phase I/Enhancing food security through improved seed systems of appropriate varieties of cassava, potato and sweet potatoes. Cassava, potato and sweet potato are three important cash and food crops, which can provide food security and climate change adaptation in the sub-Saharan Africa region. These crops have common productivity challenges and key among them is the lack of an efficient seed system to deliver, to the smallholder farmers, clean planting materials that are drought and disease resistant and adaptable to specific agro-ecological zones. To better harness the potential of these crops for food and nutrition security in the face of climate change, there is need to develop and promote well suited cultivars supported by efficient seed multiplication and delivery systems for vegetative propagated crops. Cassava – Described as a classic food security crop, cassava often offers a decent harvest in the face of erratic rainfall and infertile soils. However, in eastern Africa the crop faces challenges particularly the damaging cassava brown streak disease (CBSD). Potato – A major source of income and a staple food, the potato has suffered low productivity due to diseases like late blight and bacteria wilt and from virus. Potato leaf roll virus (PLRV), Potato virus Y (PVY), Potato virus X (PVX), Potato virus S (PVS), Potato virus A (PVA) and Potato virus M (PVM). 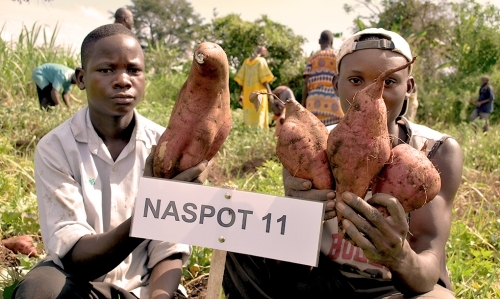 Sweet potato – the third most important tuber crop in the world and a staple in eastern Africa. Its productivity is greatly limited by sweet potato virus disease (SPVD) that has wiped out many of the desired varieties. Screen and identify appropriate cassava, potato and sweet potato varieties for adaptation to diverse agro-ecologies, disease pressure and climate change. Establish vibrant and sustainable innovation platform for cassava and sweet potatoes by linking the right partners, and supporting and strengthening these linkages along the value chain in the region, at least in the initial stages. Technical and economic feasibility of the proposed seed distribution systems in the participating countries conducted. Four stay green cassava varieties that are tolerant to drought stress developed. Three early recovering cassava varieties developed early recovering varieties have high root numbers and high starch content. Five cassava genotypes have been identified that perform well under water stress conditions and will serve as parent for drought stress improvement and genetic analysis. Five cultivars have been identified as most promising for drought/heat and disease stress with yields of more than 30t/ha and tested in Kenya. Twenty potato clones, have been evaluated under different heat and drought conditions in Rwanda. Six clones that yield above 10t/ha in the three different agro-ecological zones in Uganda have been identified. Ten varieties that possess drought resistance characteristics have been identified after evaluation in major potato growing agro-ecological zones in Uganda, Tanzania and Ethiopia. 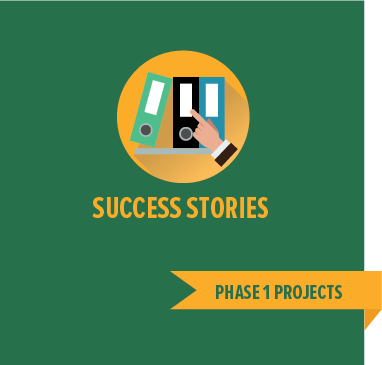 Next step for the project is taking the research outputs and innovations developed to scale and ensure that they are effectively delivered to the end users i.e. resource-poor farmers and private sector. The innovation platform to deliver improved and clean planting materials involving research institutions and the private sector will be strengthen for sustainability in at least two countries. The ultimate goal is the establishment of a vibrant tissue culture based micro-propagation seed industry for production and multiplication of improved and certified clean planting materials in the region. A policy and regulatory framework for certified seed system for cassava and sweet potato planting material will also be developed targeting the adoption in at least two countries in the region.